Track lighting has been around for a number of years and are used in a number of different commercial businesses. Ceiling track lighting can be found in offices and studios, commercial kitchens, over pub bars and conference tables and highlighting retail displays in all different types of shops. Today LED track lighting has become a popular choice for a number of commercial uses. To better understand track lighting you first need to understand what ceiling track lighting is. The Track which is the main component of the system and is mounted on the ceiling and wired to the buildings main power source. The heads which are light fixtures that hold the lamps for each fixture. The heads consist of 2 tabs that are connected to the track’s internal power source. The connectors, which allow you to join two or more pieces of track together. Most connectors are either straight or made at 90-degree angles. LED commercial track lighting is extremely versatile since you can move the light heads along the track and in many cases adjust the head to direct the lights exactly where you want need the light most. LED ceiling track lighting tracks can also be configured in various ways so they also can become a major part of the décor of the room in which the track lighting is placed. LED retail lighting gives you a good deal of flexibility in configuring your lighting system making this type of lighting perfect to use as spot lights, task lights, ambient lighting, or to highlight specific features or items. LED ceiling track lighting are specifically designed and built to be used in a variety of different spaces for a number of different purposes. LED ceiling track lights are easy to install, extremely long lasting, need little or no maintenance, and can save your business money since they are energy efficient, with some experts suggesting that your overall savings when using LED commercial track lighting can be as much as 70% or 80%. They are also environmentally friendly, which is good for your business and the world at large. Here at Ultra Beam Lighting we offer a variety of modern track lighting options that are perfect for commercial use. 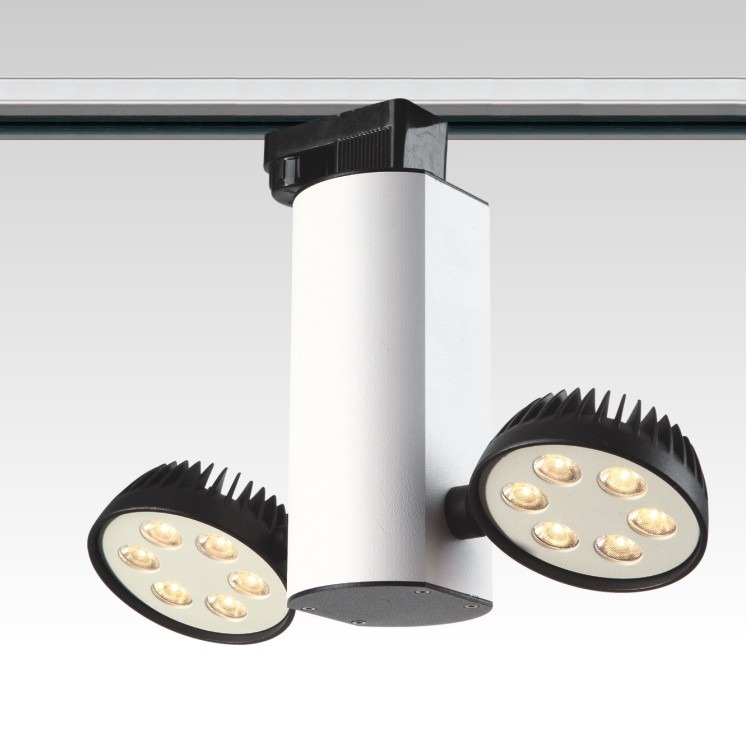 Our LED track lighting are the highest quality and use the latest in LED technology. Our lights will give you 20,000 hours of lights before they need to be changed. If you are considering Ultra Beam lighting for your office, studio or establishment and need some advice about ceiling track lighting then our experts can be of assistance to you. Please keep in mind that all lighting should be installed by a qualified electrician. Why not browse our website and see our selection of ceiling track lighting or give us a call at 0800-678-5156. Track lighting has been around for a number of years and are used in a number of different commercial businesses. Ceiling track lighting can be found in offices and studios, commercial kitchens, over pub bars and conference tables and highlighting retail displays in all different types of shops.